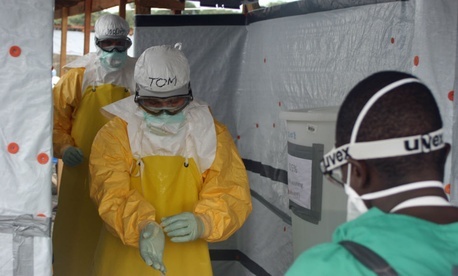 Does CDC Need More Authority to Enforce Its Own Ebola Protocols? What Would an Ebola Travel Ban Actually Look Like? Amid rising anxiety over the Ebola outbreak, a congressional panel is to convene Thursday in Washington to hear details of the two confirmed cases in Dallas and whether America's ports of entry, hospitals, and health care workers are adequately prepared to prevent a further spread of the virus. The lawmakers' inquiry will include the question of why screening procedures did not prevent Thomas Duncan from entering the U.S. from Liberia on Sept. 20, the handling of his diagnosis, and his treatment prior to his death last week, according to a memo released Tuesday by majority staffers of the House Energy and Commerce Committee. The committee will also be updated by officials scrambling to determine how a nurse who helped treat Duncan at a Texas hospital has become the first person to contract Ebola in the U.S. The hearing by the Energy and Commerce subcommittee on Oversight and Investigations, chaired by GOP Rep. Tim Murphy of Pennsylvania, had been scheduled for Thursday, even prior to Duncan's death and the news Sunday that the health care worker had been infected. "The preparedness of the United States ports, point of entry, healthcare facilities and other institutions to identify, diagnose, isolate, and treat Ebola patients in a safe and appropriate manner will also be evaluated," according to the memo released Tuesday by the Energy and Commerce majority staff. The memo at one point notes that that Centers for Disease Control and Prevention Director Thomas Frieden has attributed the health care worker's infection to "a breach in protocol," but that officials do not yet know what protocol was breached. Heading the list of scheduled witnesses at the hearing Thursday are to be Frieden, and Daniel Varga, the chief clinical officer and senior vice president of Texas Health Resources. Also set to appear are Anthony Fauci, director of the National Institute of Allergy and Infectious Diseases at the National Institutes of Health; Luciana Borio, assistant commissioner for counterterrorism policy at the Food and Drug Administration; and others. The 10-page majority memo released Tuesday lists specific issues the panel plans to examine, and background about the Ebola virus and the 2014 epidemic, treatment options, and what is known so far about the two confirmed cases in the U.S.—Duncan and the nurse. Lawmakers are expected to be told there is no FDA-approved vaccine or therapy available for Ebola, but that experimental products have been and are under development. The FDA can authorize access to potentially promising products through various mechanisms, such as an Emergency Investigational New Drug application. The memo discusses Duncan's indirect flight to Dallas from Liberia on Sept. 19, via Brussels and Dulles Airport outside Washington D.C., arriving in Texas on Sept. 20. It also notes that he sought treatment at Texas Presbyterian Hospital on Sept. 25, only to be sent home on Sept. 26 with antibiotics after "a four-hour evaluation and numerous tests." But Duncan was returned to the hospital by ambulance on Sept. 28, extremely ill, with symptoms now including severe vomiting. The memo says hospital officials testified that he was kept in the emergency department until he was officially admitted to the hospital and put into isolation. The hospital notified Dallas County health officials on Sept. 29, and they arrived on site soon afterwards. CDC officials also were notified on Sept. 29, but did not arrive until Oct. 1, according to the memo. Lab testing had confirmed Ebola on Sept. 30. The subsequent investigation into Duncan's contacts while he was contagious has so far identified 48 people out of what the memo says is a broader group with risk of exposure. Ten of those are considered to be at high risk, including four close family members. The family members initially failed to comply with a request to stay at home through Oct. 19 (when a 21-day incubation period for the virus would have lapsed), and were subsequently forced to remain for days in an apartment that was contaminated with Duncan's bodily fluids. The family has since been moved to an undisclosed location. As of the memo's release Tuesday, there remained questions about why the nurse—identified in news accounts as Nina Pham but in the memo only as a health care worker—tested positive for Ebola, despite her having worn a mask, gown, shield, and gloves as she helped care for the dying Duncan. The memo says that since testing positive on Saturday evening, she has been isolated and interviewed by CDC personnel to identify any contacts or community exposures. So far, one such contact has been identified and monitored for fever and other symptoms. The memo quotes Frieden as saying the worker's infection was due to a "breach in protocol," as the CDC investigation into exactly what protocol was breached is ongoing. "What have we learned from the two Ebola cases in Dallas, and how can we use this information to improve protocols, training, guidance, hospital preparedness, patient care and safety going forward, both in the U.S. and West Africa?" the memo poses as an issue to be examined by lawmakers.